I haven't read nearly enough of David McCullough's books. This is my second and I loved it. 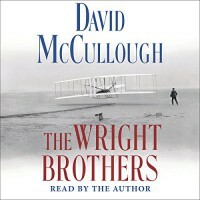 The story of the Wright Brothers is as fascinating as it is incredible. From this book I learned that they were hard working men and SO determined. Never did they give up-despite the failure of numerous tests. Neither did they ever become anyone's pawn-they refused many offers of financial backing. Even though there were times when I'm sure they could have used it, they preferred to remain independent. They may have been disturbed at times by newspapers and various magazines that described them as crazy and wasting their time, but they paid no heed. They camped out, in tents and outbuildings when performing their aerial testing-often coming close to running out of food. They were attacked by mosquitoes-once so severely they almost gave up and went home. I think the trait that stuck with me the most was their humility. In much the same way that they ignored the doubters and naysayers, they also ignored those who wanted to put them on pedestals. They always kept their heads down and their eyes on the ball. From their interesting family life, to their bicycle shop and all of their various ups and downs, I found the Wright Brothers to be interesting and amazing examples of American entrepreneurship. I find myself inspired by their story and proud to be from a country that could inspire men to such greatness. I recommend this book to anyone even slightly interested in learning more about the Wright Brothers. I checked out the audio book from the library since I loved McCullough's John Adams so much, and I am so pleased that I did. This was an interesting and fun journey and I can't wait to read or listen to more of McCullough's works in the future.